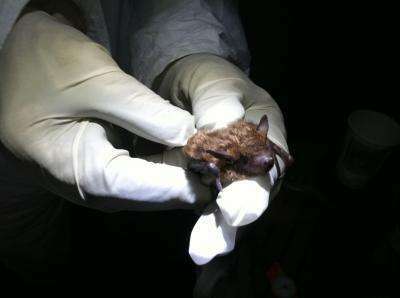 U.S. Forest Service researchers have identified what may be a key to unraveling some of the mysteries of White Nose Syndrome: the closest known non-disease causing relatives of the fungus that causes WNS. These fungi, many of them still without formal Latin names, live in bat hibernation sites and even directly on bats, but they do not cause the devastating disease that has killed millions of bats in the eastern United States. Researchers hope to use these fungi to understand why one fungus can be deadly to bats while its close relatives are benign. The study by Andrew Minnis and Daniel Lindner, both with the U.S. Forest Service's Northern Research Station in Madison, Wis., outlines research on the evolution of species related to the fungus causing WNS. The study is available online from the journal Fungal Biology. "Identification of the closest known relatives of this fungus makes it possible to move forward with genetic work to examine the molecular toolbox this fungus uses to kill bats," according to Lindner, a research plant pathologist. "Ultimately, we hope to use this information to be able to interrupt the ability of this fungus to cause disease". The study is an important step toward treating WNS, according to Mylea Bayless, Bat Conservation International's director of conservation programs in the U.S. and Canada. "This research increases our confidence that this disease-causing fungus is, in fact, an invasive species," Bayless said, "Its presence among bats in Europe, where it does not cause mass mortality, could suggest hope for bats suffering from this devastating wildlife disease. Time will tell." White Nose Syndrome was first observed in 2006 in a cave in Upstate New York. Since then, it has spread to 22 states in the United States and five Canadian provinces and has killed large numbers of hibernating bats, a problem resulting in substantial economic losses. A marked decline in bat populations in the eastern United States was documented in a study published last month in PLoS One by Sybill Amelon, a research biologist with the Forest Service in Columbus, Mo., and co-authors Thomas Ingersoll and Brent Sewall. The study found cumulative declines in regional relative abundance by 2011 from peak levels were 71 percent for little brown bats, 34 percent for tricolored bat, 30 percent in the federally-listed endangered Indiana bat, and 31 percent for northern long-eared bats. 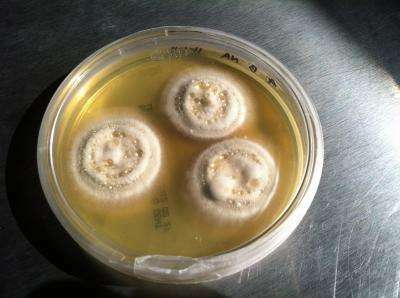 In 2009, researchers identified the culprit behind WNS as a member of the genus Geomyces, resulting in its name Geomyces destructans, or G. destructans. Minnis and Lindner generated DNA sequence data and found evidence supporting a shift in the genus to which the fungus belongs, resulting in a new name: Pseudogymnoascus destructans, or P. destructans. "This research represents more than just a name change," according to Bayless. "Understanding the evolutionary relationships between this fungus and its cousins in Europe and North America should help us narrow our search for solutions to WNS." The study is based on a foundation of collaborative research among the U.S. Forest Service, the USGS National Wildlife Health Center, and the U.S. Fish & Wildlife Service, and is a continuation of pioneering research initiated by Canadian researchers at the University of Alberta and European researchers, including those at the Centraalbureau voor Schimmelcultures in The Netherlands. "Collaboration is key to responding to problems as devastating as WNS," said Michael T. Rains, director of the Northern Research Station. "We have come a long way since we first encountered WNS, in large part due to the cooperation among government agencies, universities and non-government organizations. For this study in particular, USGS and Fish & Wildlife Service partners played critical roles collecting the fungi used in these studies. Problems this large will not be solved without unprecedented cooperation, and this study is a great example of that."